A very common problem Water gathering in the bottom of my refrigerator. If you have a refrigerator chances are that this has happen to you at least once. When your drain line freezes, water can not drain to your drain pan and causes the water to over flow into your refrigerator or freezer depending on the style of refrigerator you have. Let me first explain were the water is coming from in the first place. (Assuming you have check to make sure that the water is not coming from the ice maker or broken water line). When your refrigerator cools it build up ice on your evaporator (see below). Modern refrigerators have automatic defrost cycles that melts the ice that accumulates on the evaporator. The water drips onto a tray that directs it down the drain line into your drip pan that is located under your refrigerator. From there the water evaporates. What happens is the water freezes over the top of the drain line so the water has no choice to flow into your refrigerator or freezer. If your freezer is on top the water will start dripping into the refrigerator. 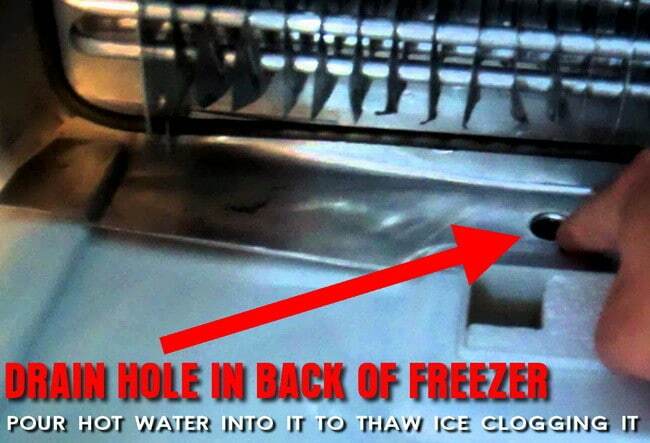 If you have a side by side the water will over flow into the bottom of your freezer. And some times out the door and onto the floor. So if you see from time to time water pooled in front of your refrigerator this is what is happening. Your evaporator is located behind the back wall of your freezer. Find the screws that hold it in place and remove it. The above picture shows what you should see. I like to take a measuring cup and bring some water to boil in your microwave and slowly pour the water into and over the drain line. Wait a minute and use a towel to soak up the water. Just repeat until the drain line is clear and you can see water draining. What also works most of the time is the easy way. Completely empty your refrigerator, open the doors, and unplug it. Keep it this way for 12hrs to make sure it has completely defrosted. I would suggest doing this first. It works 90% of the time and you do not have to take apart your refrigerator. I hope this helps but if you need company in the Dallas or Plano Tx area give us a call.